A superb looking Italian-made boiling & chilled hot tap delivers instant boiling and chilled water at the touch of a button in offices, leisure clubs and hotels; the Cosmetal Pro-Stream Boiling & Chilled Under Counter Water Tap system saves a significant amount of space by locating powerful heating and ice bank water chiller units hidden away under the worktop so that just a trendy tap is visible and ready to serve! We install these water taps all over the UK with site survey arranged and Everpure Claris water softener filter plus 6 monthly sanitisation visits and water filter changes for your Cosmetal Pro-Stream boiling and chilled under-counter water tap. 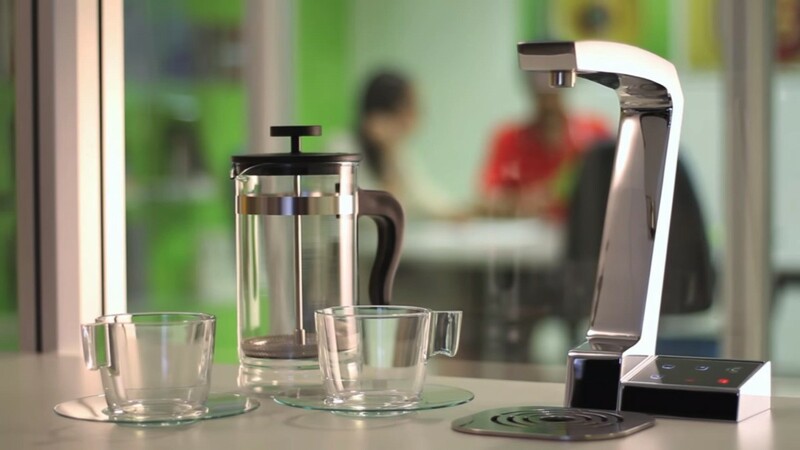 The system includes a smart touch screen selection pad on the ultra-stylish cool-to-touch tap that dispenses around 200 cups per hour of boiling hot water with the stainless steel drip tray being plumbed to waste. Save yourself both energy, time – and of course money – in making hot drinks at the office: tea, coffee and other hot chocolate in just a few seconds and then you can use the same tap for pure filtered and chilled water to keep hydrated and at the top of your game all day long! The Pro-Stream water tap comes in several configurations and you can add a sparkling chilled water option if you wish. All supply and fit packages can be placed on a 3 year lease rental deal to save on up-front capital costs; so – for example – a purchase price of £2750.00 + VAT would equate to a cost of around £92.00 + VAT per month with the option to add 5 x 6 monthly sanitisation and filter change visits over a 3 year period coming to around £127.00 + VAT per month. Phone us today to discuss your needs further or talk to us about our range of office coffee machines. Specialist suppliers of under-counter water cooler taps to rival brands like Zip, Billi and Vivreau in London and UK-wide. 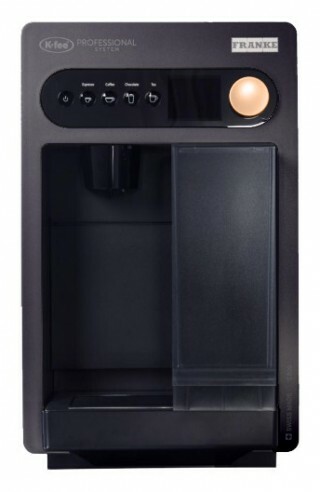 The Franke C200 capsule coffee machine is an ideal Kenco Singles capsule coffee machine replacement which boasts Swiss design elegance which is very functional and requires little space, and offers outstanding value for money; combine it with K-FEE capsules for a perfect replacement for Nespresso, Kenco Singles or Keurig Capsule Coffee Machines. 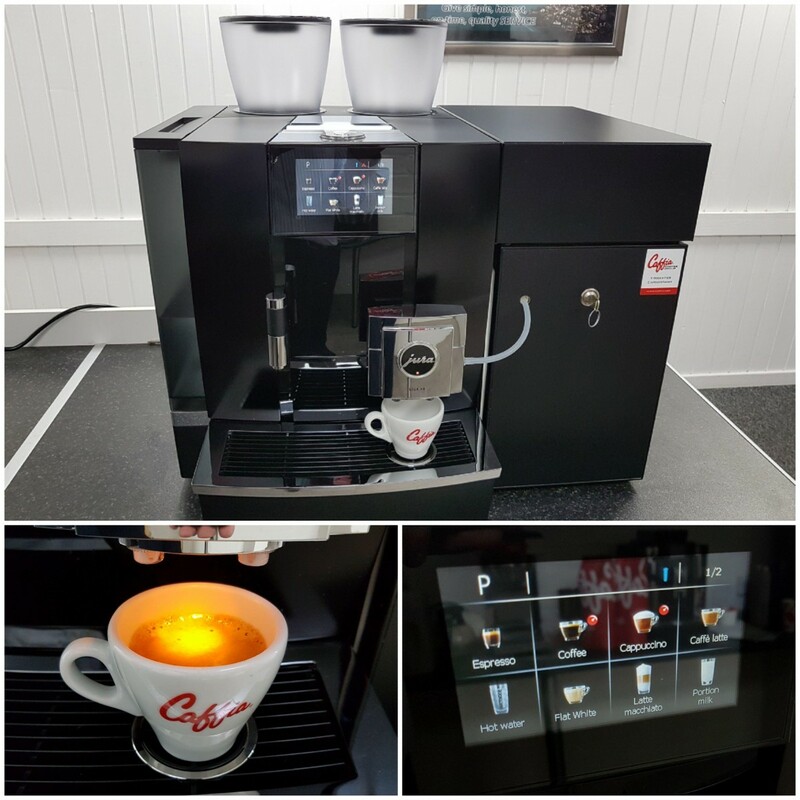 From a simple espresso or americano with a wide range of pure Arabica coffees, the C200 capsule coffee machine from Franke Coffee Systems is a treat for any taste. It also brews wonderful teas, from classic Earl Grey to chai latte, and also hot chocolate. Use the Franke C200 capsule coffee machine for offices for superb fresh coffees, leaf teas and chocolate beverages in the finest professional quality. K-FEE is a proven expert in the field of hot drink capsule technology developed for cafes, restaurants and offices as a patented, multi-beverage solution. 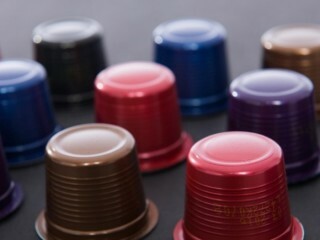 K-FEE have developed a professional capsule with more content for a more intense taste – even in large beverages. The shape prevents capsule theft in the office, hotel or shop. 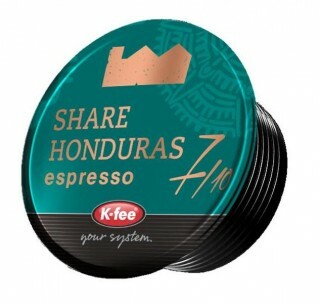 The K-FEE capsules cannot be used in any other coffee machines. The LCD display automatically tells you when you need to refill the feed water or empty the capsule container. This capsule coffee machine offers another great advantage as the coffee machine cleans itself; the process for cleaning and hygiene takes place internally so there is no contact with chemicals. 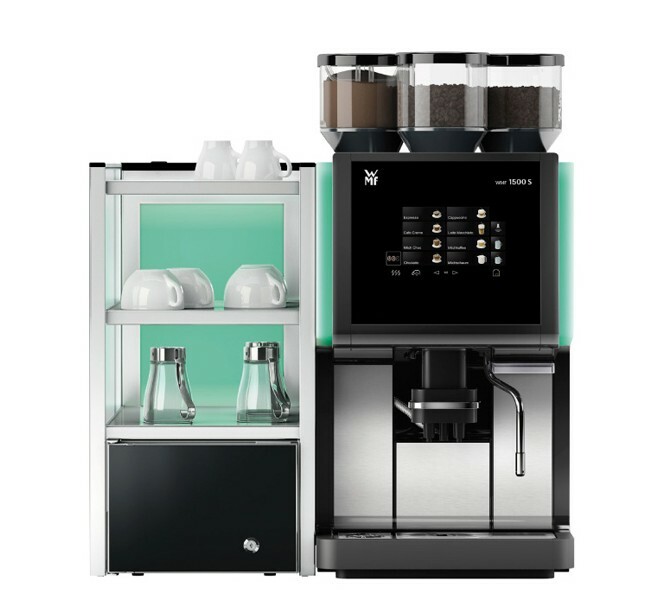 We offer this capsule coffee machine on a 3 year lease rental deal and a whole range of other office coffee machines as well! Why not call us on 0203 096 7233 or 01324 617618 to discuss purchase or lease-rental rates? 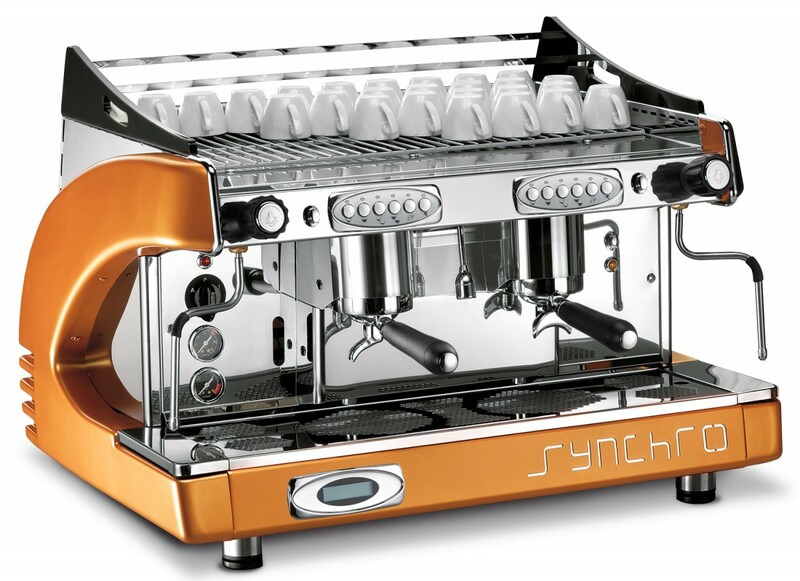 Suppliers of 2 group and 3 group espresso coffee machines in Bristol and Avon area, call 01452 203147 to discuss our broad range of espresso coffee machines from Cimbali, Royal Synchro and Esprezzi and also compact 2 group models for sites with limited budget or space. Our heavy duty coffee grinders are normally from Macap or Mazzer which are both premium Italian brands and also offer precision digital grind-on-demand grinders for demanding baristas. Ideal for cafes, restaurants, bars and hotels in Bristol and Avon, our range of traditional coffee machines is flexible, well priced and with service back up, water softener filters and full staff or barista training. How does a traditional espresso machine work? These beautiful machines work by pumping hot water through the bed of fine ground fresh coffee in a ‘group handle’ or ‘portafilter’ at a very high pressure of around 9 bar or 150 pounds per square inch in order to extract a very intense and aromatic cup of espresso which is the basis and starting point of the whole modern speciality coffee drinks line-up. Making a flat white, cappuccino or caffe latte involves heating and foaming and texturing the milk (we generally recommend semi-skimmed) with a cappuccino having more tiny air bubbles as foam on the top. This is generally done with one of the steam arms and via careful control of the steam valve, there is a saying in the trade ‘silk, not milk’ which aptly describes the end result of a silk smooth latte to enjoy! 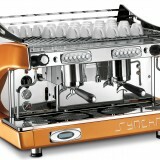 More details of our full range of commercial espresso machines can be seen on our corporate website here. Purchasing a full espresso machine package with coffee grinder, water filter etc can be really quite heavy on the cash flow so we also offer rental of espresso coffee machines via a lease-rental finance deal with respected finance brokers and a 3 year lease rental deal; this is a handy and easy service the spreads out the cost of the equipment and eases cash flow. 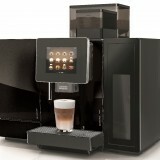 If you have to be in London then why not come and see our London coffee machines showroom? This is located at Gee Street, near to Old Street and Barbican; see it on Google Maps here. 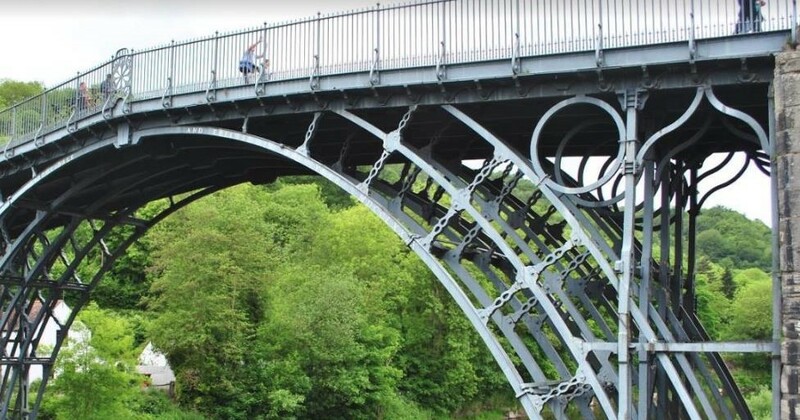 Contact us to discuss your needs in more detail today on 01452 203147. We offer a range of bean to cup coffee machine with under counter milk fridge models from Franke Coffee Systems like the Franke A600 and A800. The great benefit of an industrial bean to cup coffee machine with under counter milk fridge is neat appearance, high capacity for fresh milk and space saving for the client – you can see above a pair of robust Franke A800 FoamMaster bean to cup coffee machines that replaced a costly and unreliable Scannomat TopBrewer coffee machine to great effect in a central London site. We also supply a wide range of espresso coffee beans for TopBrewers and other major brands of bean to cup coffee machines in London offices and throughout the UK. A bean-to-cup coffee machine offers a very high quality of drink like flat white or latte machiatto / hot chocolate with fresh milk that is akin to a coffee shop standard and yet is very reasonable in cost – often just 10 to 15p compared to £2.50 or more in a cafe! Would you prefer your staff to stay at work and be more productive? Well, this is another reason to consider a bean to cup coffee machine with under counter milk fridge from our range. Simply touch the screen for a delicious coffee to be dispensed into a china cup, mug or paper cup of your choice. 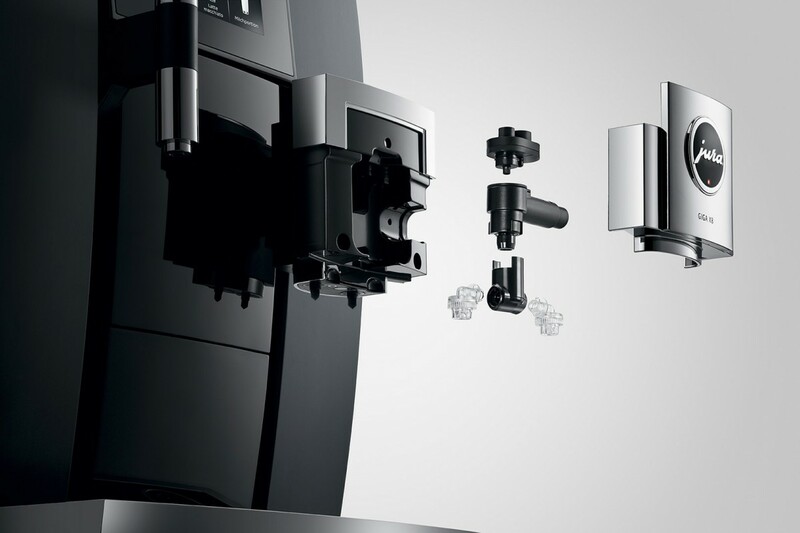 You can see the full range of Franke Coffee Machines here. 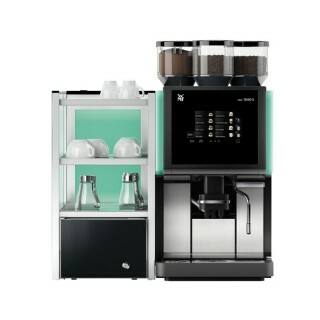 The Jura Giga X9 coffee machine is one of the top models of automatic bean to cup coffee machines from Jura Elektroapparate AG; a Swiss brand of professional coffee machines for restaurants and offices where the high-quality flat white, caffe latte and espresso delights many a customer every day. 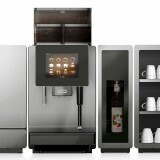 The Giga X3, Giga X8 and Jura Giga X9c are the top models and have greatly enhanced drink temperature and programming features and cutting-edge design and looks. They are also much easier to clean than earlier models and offer extended ‘on-site’ warranties. The Jura Giga X9c coffee machine offers a dedicated steam arm for automatic milk foaming as well as the integrated foamer behind the coffee dispense head – why not use this for soya or almond milk to offer more variety to customers? Having 2 ceramic disc grinders means quiet, long lasting and precise grinding with grinders that keep cool and enhance the coffee taste. TFT screen technology on the Jura Giga X9c makes for a clear display which helps with hugely flexible programming and more than 25 drink options to choose from; this coffee machine can dispense 2 cappuccinos, 2 flat whites or 2 caffe lattes at once; plus hot water from telescopic outlet which has clearance for the tallest cups or mugs. We recommend this machine for sites serving up to 200 cups per day; it is available with either the 1 litre milk cooler or more robust 4 litre milk refrigerator and a 2 year parts and labour warranty; it is only available as a plumbed in version in the UK. 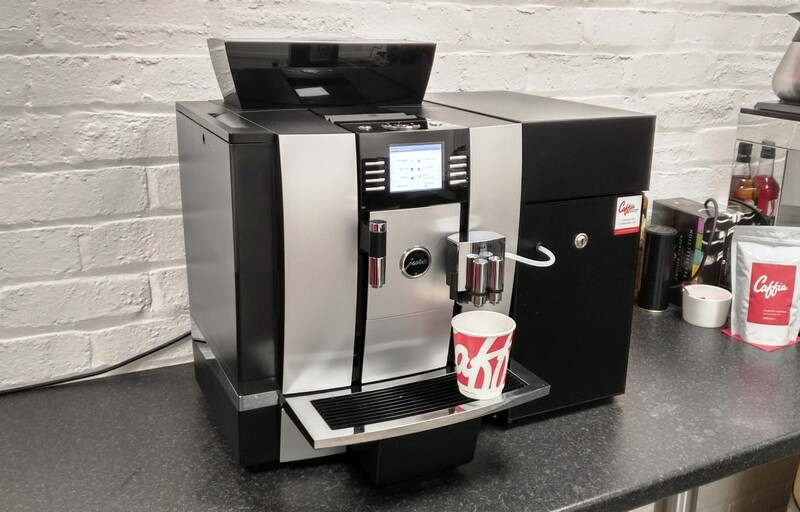 We also offer lease rental of our coffee machines range – this is a simple arrangement whereby the machine is placed on a 3 year lease deal with a finance company that is tax efficient and spreads out the costs so that you earn as you pay. Size (WxDxH): 370 x 497 x 565mm – Power: 2.3kW. 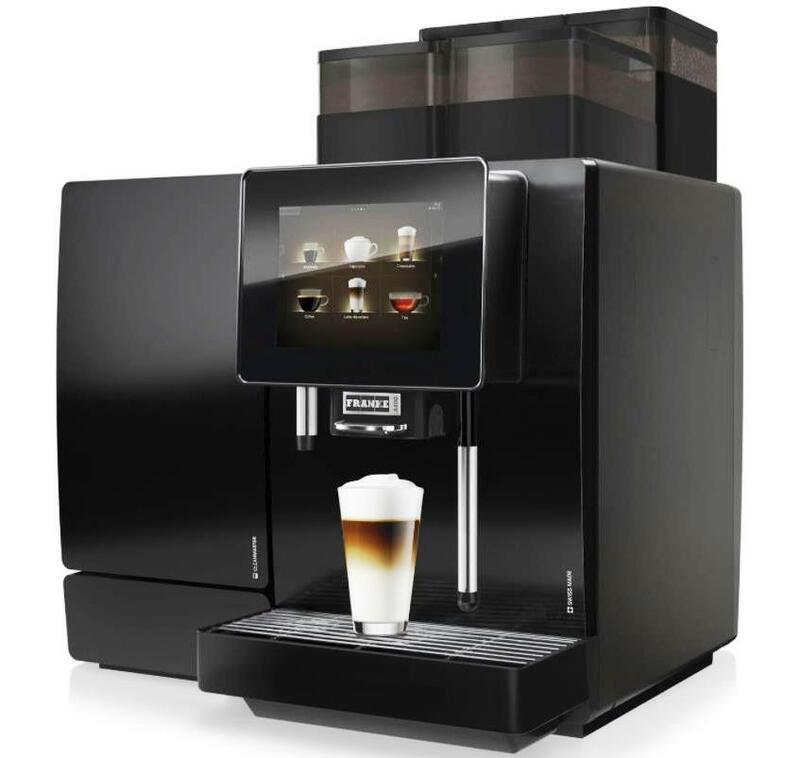 Offering a wide range of coffees and hot chocolate, consistent high quality drinks, space-saving design, optimal reliability as befits a German made professional coffee machine, easy use and cleaning. With the Dynamic Milk System from WMF you will find that preparing cold milk foam coffees is now as easy as creating the classic caffe latte or macchiato or cappuccino. 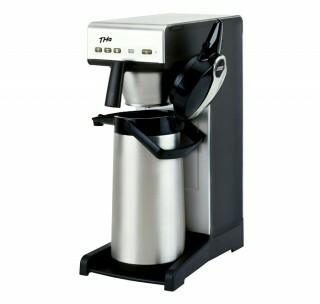 The WMF 1500S commercial coffee machine can be combined with a range of cup warmers and milk coolers. The narrow WMF Cup&Cool unit here in our picture includes heated cup warming shelves and a 4.5 litre milk cooling fridge which integrates with the machine and the Dynamic Milk System technology available on the WMF 1500S coffee machine. The Jura Giga X8 Generation 2 Coffee Machine is the latest product from Jura Elektroapparate AG, the Swiss maker of top-quality automatic bean to cup coffee machine, they are an amazing company – they never stop innovating with their superb Giga range of touch-button bean-to-cup coffee machines following the introduction of the more compact Jura JX8 earlier this year! 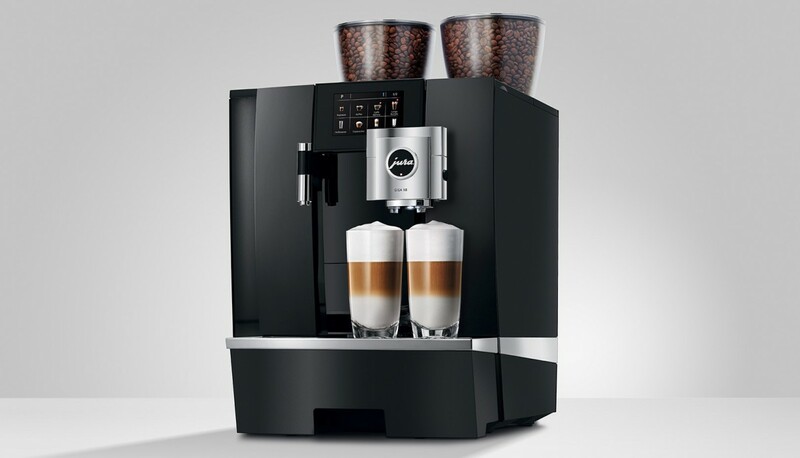 Now arrived at our Falkirk and London showrooms is the stunning new Jura Giga X8 Generation 2 Coffee Machine with touch-button selection screen, improved body panels and smart new look and improved easy-to-clean and remove milk foamer on the updated version; the milk foam is – if possible – even better than the existing machine with smooth and silky texture as we have seen on the Jura JX8 machine and incredibly quiet operation with impressively smooth grinders. Here we bring you some initial images and certainly a picture tells a thousand words! 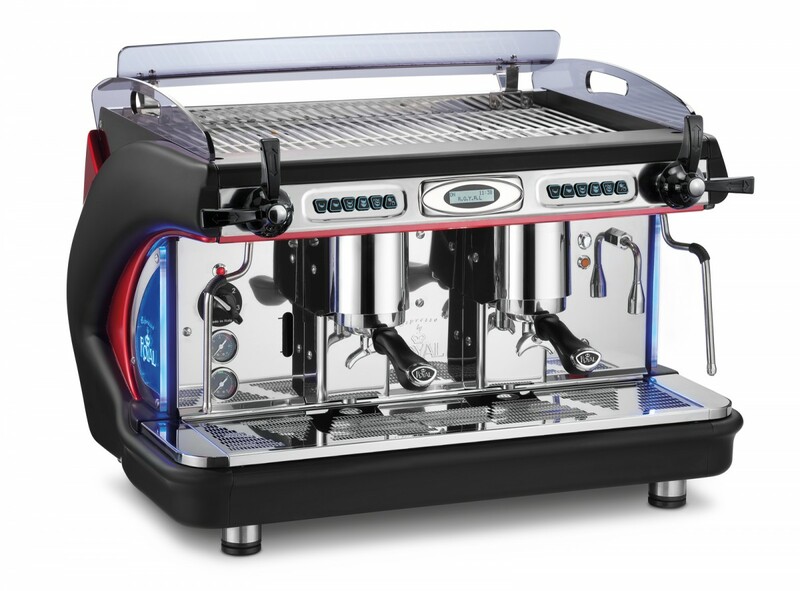 This stunning new Swiss coffee machine has been one of our favourites for many years and will be greatly improved so great news all round on this – you can see the full range on our other website here. To beat the existing model Jura Giga is – to say the least – difficult; we sold them with great success to an astounding range of places – have you been to the Standing Stones Hotel on the Isle of Lewis? On an intercity high-speed train to London? To the beautiful Island of Alderney? All of these locations have the existing Giga X8 churning out flat whites, lattes and espresso’s at a great rate every day. We supply a commercial and office coffee machines Telford and Wrekin area, Bridgnorth, Wroxter, Cosford, Newport, Gnosall and across Shropshire and mid-Wales; call us on 0121 289 4229. We’re a dynamic family-run coffee business with offices in both Birmingham and Stafford and are well placed to assist you in your quest for quality coffee in the workplace, golf club, farm shop, hotel or restaurant in the Telford area. 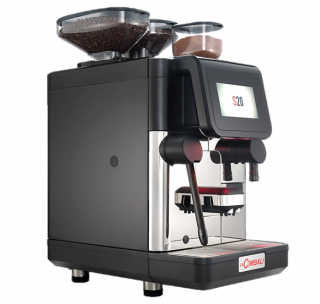 Brands that we offer include Franke Coffee Systems with the A400 and A600/A800 heavy-duty bean to cup coffee machines, La Cimbali S30 and S20, M54 and M39TE models, the Jura Giga X8 and Bravilor Esprecious bean to cup coffee machines with fresh milk just to name a few. 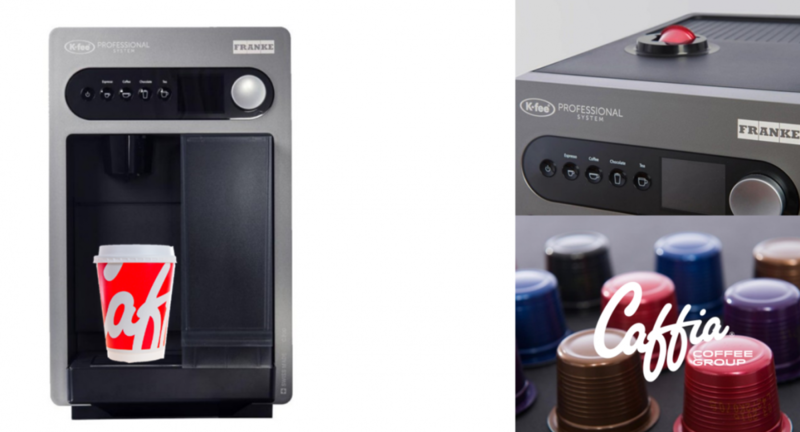 These are all genuinely remarkable coffee machines, the great news is that many flaws – such as the coffee being too cold or the machine being difficult to clean – have actually been for the most part solved and the newer generation bean to cup kit is ideally fit for purpose! See the Franke A600 FoamMaster in action on this video – you can almost taste it! 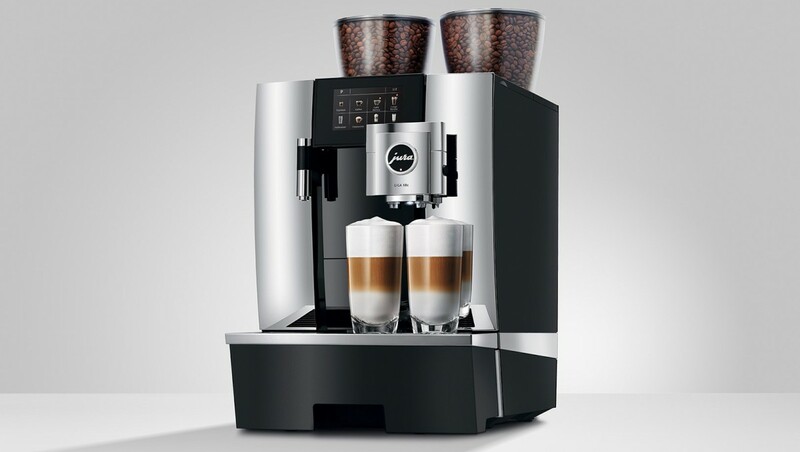 We also offer the Necta Koro Max Prime, a table top bean to cup coffee vending machine which is very popular in car showrooms which uses powered 100% pure milk granules and powdered hot chocolate as well as fresh coffee beans to offer a range of speciality coffee drinks like caffe latte, cappuccino, espresso and hot chocolate at the touch of a button. Our commercial coffee machines Telford and Wrekin range also includes both 2 group and 3 group espresso coffee machines and grind-on-demand coffee grinders for cafes, hotels and restaurants; the Synchro 2 group (as seen below in orange), Cimbali M34, Wega Polaris and Esprezzi series machines are installed with full barista training, free coffee beans and Macap MXA or MXD coffee bean grinders. Filter coffee machines still form an important part of office coffee service and conferencing and breakfast coffee in hotels and convention centres. 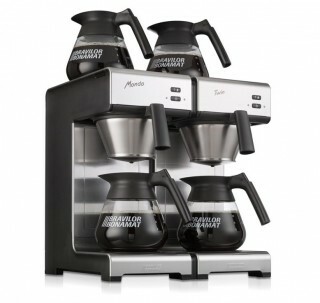 Designed for either flasks or glass decanters, we also offer a range of bulk brew coffee machines like the Marco Jet, Bravilor B10 or Coffee Queen coffee machines. Caffia Coffee Group also stocks a range of 8 different espresso coffee beans and 8 types of filter coffees including Fairtrade and Rainforest Alliance certified coffees along with double-wall compostable paper cups, sipper lids, teas, hot chocolate and sugar sticks. We deliver all over the UK on next day courier; give us a try on 0121 289 4229 next time you need a coffee machine or coffee samples! Many clients need a coffee machine but that is not all they need in their outlet – this means that coffee machine lease-rental deals that spread out the cost of your equipment are very popular, ask us for a quote and we will be pleased to assist. 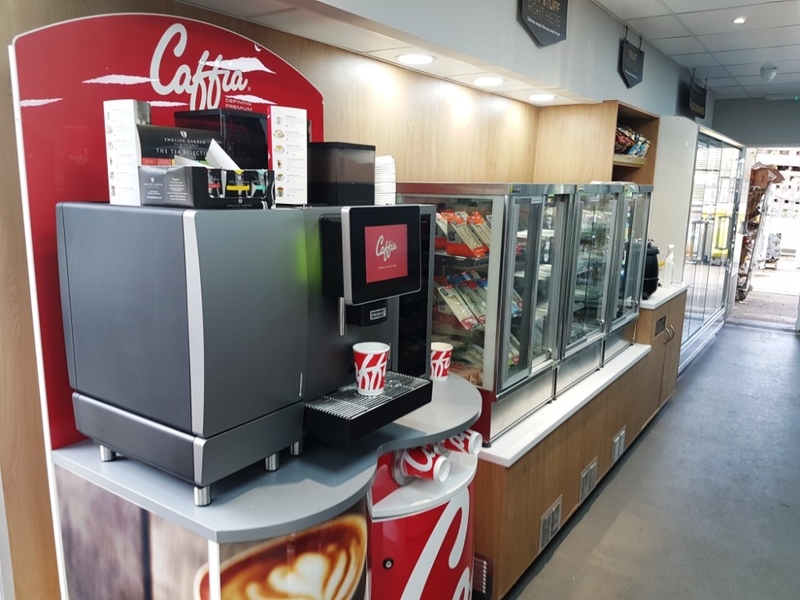 Caffia Coffee Group is a family-run supplier of corporate coffee machines for the workplace with a wide range of bean-to-cup and automatic hot drinks machines and filter coffee brewers for all sizes and budgets in the corporate coffee machines market. 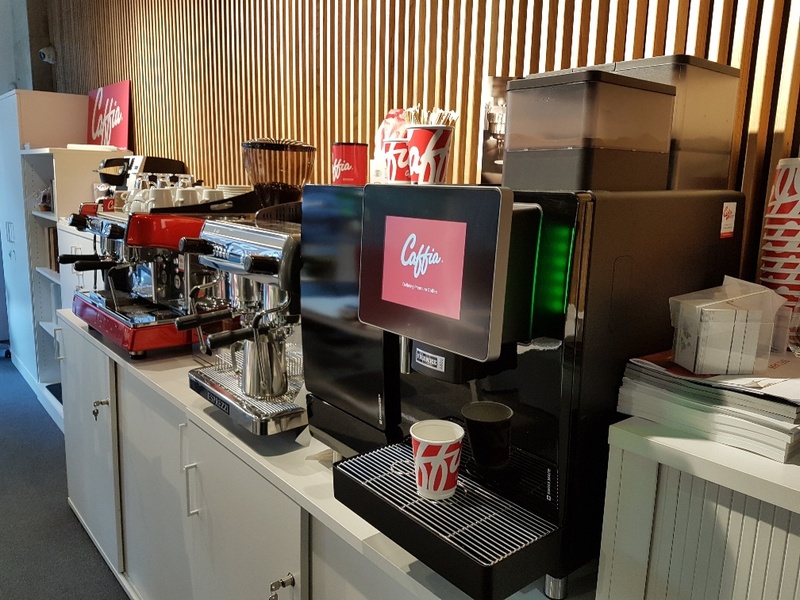 Visit our central London showroom or call us on 0203 096 7233 to discuss your needs further and try out our equipment; we think great coffee is a real necessity for corporate offices; there can be little doubt that staff and visitors enjoy good coffee and the morale boost it brings them in the daily grind. Coffee machines with contactless payment like the Franke A600 or Jura Giga X8 Generation 2 are also an excellent choice in a business centre or hot desking workplace. Above: The Caffia Coffee Group London Showroom. 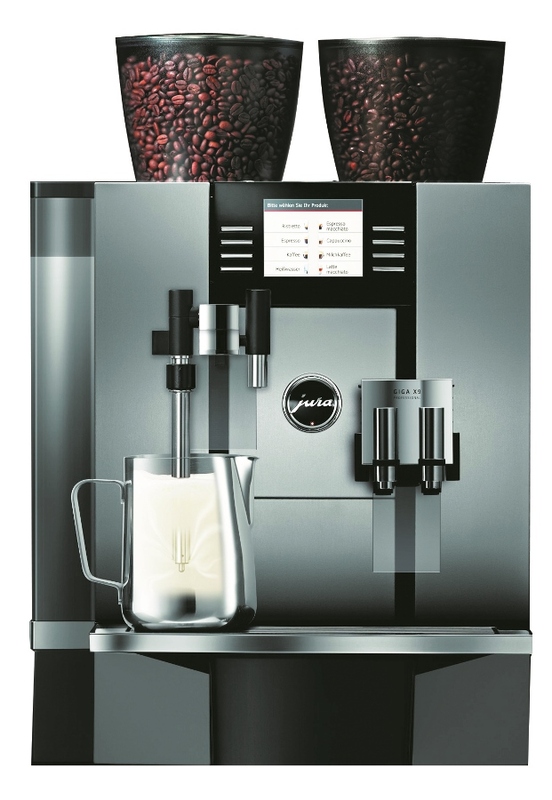 A compact coffee machine like the Jura JX8 bean to cup will be ideal for smaller offices, these machines are easy to use and clean and operate very well with demand of upto 75 cups per day bringing coffee shop quality flat white, espresso and caffe latte made with fresh milk and espresso coffee beans to the corporate workplace. We have a range of both instant and fresh coffee bean-to-cup coffee machines to cater to different tastes offering capacities between 20 and 300 cups per day. Instant coffee machines have the advantages of being quick and easy to use, whilst a bean-to-cup offers the user a fresh-brewed drink; our range of espresso coffee beans is comprehensive and includes 8 different blends and pures; you can browse our main website here for more details. Above: The Jura Giga X3c Bean To Cup Corporate Coffee Machine. Our wide range of corporate coffee machine brands for your workplace includes coffee machines from Franke, Jura, Necta, Cimbali, K-FEE and Bravilor. It is not just sophisticated touch-button equipment that we offer but also filter coffee brewers for corporate meetings and business conferences and also plumbed-in water coolers for a source of filtered and chilled drinking water. All our equipment is supplied with full installation, staff training and appropriate Everpure Claris Ultra 1500 water filter unit. We have two showrooms- one in central London at 47 Gee Street, Clerkenwell and one at our Falkirk office in Scotland; please do feel free to call in to see our range of coffee machines and coffee supplies or call us on 0203 096 7233 or 01324 617618. Suppliers of commercial and office coffee machines Hull, Immingham and Grimsby area and across Lincolnshire and Humber; please call our Sheffield office on 0114 350 3328 to discuss your needs. Our 2 group and 3 group Wega and Cimbali espresso coffee machines, coffee grinders, Bravilor filter coffee machines and Franke A400 bean-to-cup coffee machines and perfect for hospitals, universities, restaurants, coffee shops, hotels or golf clubs across the area. A popular machine with all these sectors and offices as well is the Jura Giga bean to cup machine. 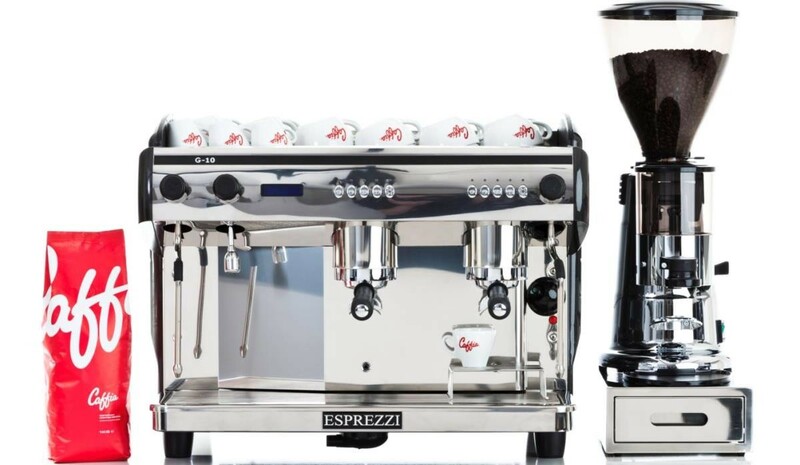 This is a Swiss-made coffee machine serving up to 150 cups per day of an excellent range of coffee drinks like caffe latte, espresso and flat white made from coffee beans and fresh milk. Talk to us about the exciting Franke A600 FoamMaster, a heavy-duty bean-to-cup coffee machine for hospitals, garden centres and service stations in Grimsby, Cleethorpes and Skegness area. As well as coffee machines we offer a wide range of 16 different filter coffee sachets, Fairtrade coffees, fresh espresso coffee beans, teabags, hot chocolate sachets, sugars, crockery and coffee machine cleaning materials.